You have 100 words to add to the prompt making 108 in total. Please don’t split the prompt and remember to make a link back here so that others can find us. Click here to enter your link. It will take you to another page but I will transfer it back here as soon as possible. …the rain turned the road..
OK. I see that when I open your “Click here” link in the line “Click here to enter your link,” I can then click each link individually which will then open in a new tab or window. BTW – I linked my website entry but it hasn’t come up yet., Do you have it? or did i do something wrong and I need to re-enter it? I’m not able to move the link to the main post yet but will do so ASAP! Not sure what you mean. If you go to ‘click here’ that takes you to all the links as well. Hi, I was wondering, can anyone join the Scribbles challenge? I love poetry. Not sure if I’m any good at it but would love to try! 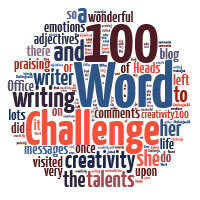 Pingback: 100-Word Challenge: Neither Hell nor High Water | Even More BonusParts! Today’s prompt inspired me after a couple of weeks of uncomfortable things rattling around in my head. Thanks for that. Huge apologies again; I failed to include the 100WCGU badge. I don’t think I made my quota of comments this week, either, but I’m ready to go again.